The Anasazi ruin is shaded from the summer sun, but in the winter, the sun will warm the structure. Passive solar design has been utilized for thousands of years. 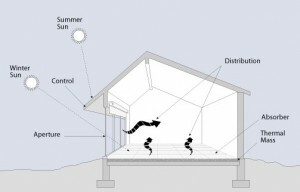 Passive solar design uses the sun’s energy and movements to help heat a structure in the winter and uses certain building materials, or surrounding elements, along with the sun’s movements to stay cool in the summer. I first became aware of the synergy of efficiencies within passive solar design on a hiking trip into the desert backcountry. I saw that the southwestern cliff dwellers, the Anasazi, benefited from passive solar design. By using the southern facing cliff overhangs, they lived in ideal locations that were shielded from the sun in the summer, yet received full sun in the winter. In the picture, near the bottom of the cliff, there are two very small people looking at a dwelling. Notice that the dwelling is tucked away in the shade. The summer sun’s reach, in the form of an arc can clearly be seen. A tier up, there is another dwelling, also in the shade. 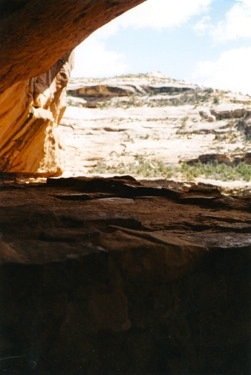 Because they used rocks (a material with thermal mass – a material that absorbs, stores and slowly releases heat) the Anasazi utilized passive solar cooling and heating techniques. Passive solar design is still utilized today and if done correctly, can make dramatic cuts on the money spent on utility bills. If the home is oriented toward the south, an overhang can be easily built into the roof and can block the summer sun from entering the home. While we have long known that the sun brings warmth, the direction that houses are orientated in has typically not been taken into account when suburbia was built. Passive solar building has benefited humanity for thousands of years. Building structures so that they are situated toward the south was also done in Chaco Canyon and Mesa Verde. Even the ancient Greeks took the southerly direction in account when building a structure. There are remnants of a structure or small granary in the cliff. Notice how the overhang provides shade from the summer sun. If you look into the dark, cool recesses of the cliff, you will be able to make out a small building. Note that only the southern facing cliffs were used for the cliff dwellings that the Anasazi were known for. They were used for the same reasons that southern facing windows are used in current passive solar design. These cliff dwellings are in the Grand Gulch – Cedar Mesa area located in southeastern Utah. Grand Gulch is a primitive BLM area that offers multiday hiking trails through roadless, winding sandstone canyons and it also happens to have a unique and a high concentration of well-preserved Anasazi ruins. I started at Kane Gulch trail and exited through Bullet Canyon. As I hiked, I had my camera easily accessible as my eyes scanned all the rock canyon surfaces for signs of a cliff dwelling or petroglyphs (rock carvings). I had a map, but while walking along the path, it was easy to miss the rock dwellings, as the rock used to make the buildings blended perfectly with the surroundings rock walls. It must have been a choice place to live because of many different features: creeks run in the springtime and along with natural springs, supply needed water to the occupants. As I walked along scanning and exploring various cliff sections, I took a fairly long time to get through the canyons, as I didn’t want to miss something interesting. On the second day, another hiker I gave some advice and said, “If there is a southern facing rock overhang, look below it and it is likely that there is a ruin underneath.” Ah ha! I could save time by scanning only the southern facing cliffs, as it was the only location that the Anasazi built their cliff dwellings. 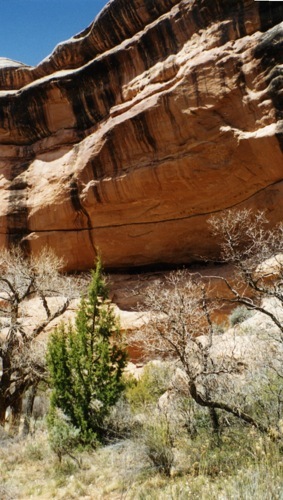 Kiva in Grand Gulch, shaded by the overhang and protected from the summer sun. The advice held true. 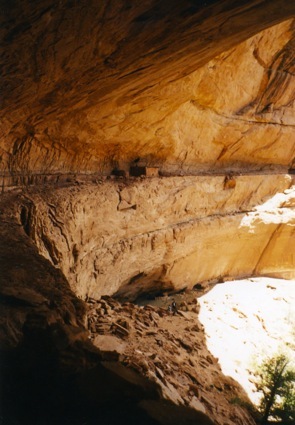 The Anasazi benefited from the elements of passive solar design. By using the southern facing cliff overhangs, they utilized passive solar cooling and heating techniques. The picture to the right shows the top of a kiva being shaded by the summer sun. The high rock overhang shades the dwelling from the high summer sun, keeping it in the shade, and the rock and its thermal mass cool. In the winter as the sun travels a lower path in the sky, because it is in a southern facing cliff, the sun will hit the dwelling all day. 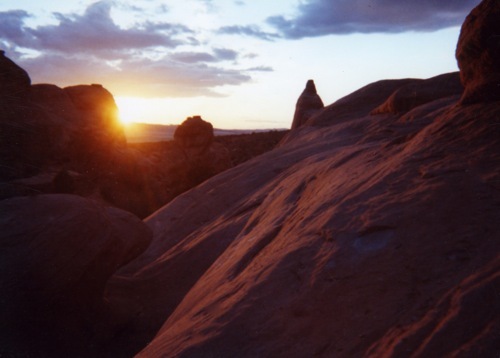 Because rock has a lot of thermal mass, it will store the solar heat, then slowly releases the heat energy throughout the evening and into the night. The setting sun in the Canyonlands. In addition to demonstrating passive solar design of the Anasazi, the canyons also have remnants of pottery and small, burnt corn cobs. If you visit the area, it’s important to leave everything where you find them so that those after you are also see, learn and enjoy the area.